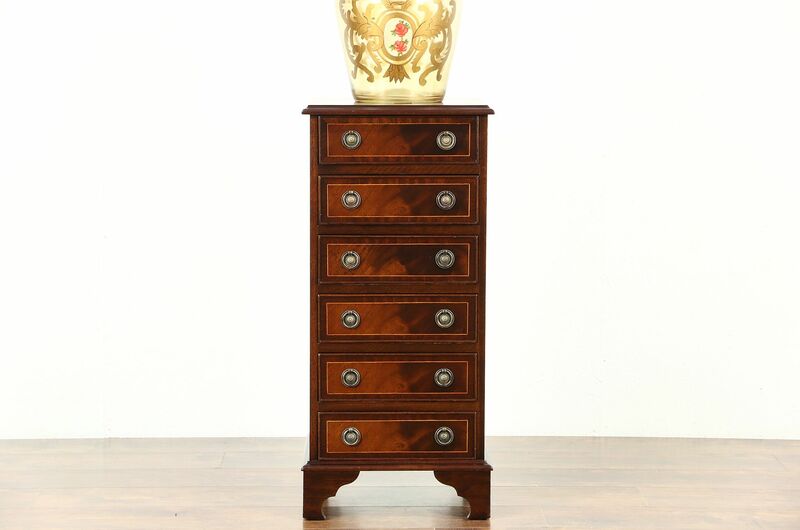 Whether used as a silver, jewelry or collector's chest or nightstand, this six drawer cabinet is charming. Mahogany with matched flame grain and banding has an excellent renewed finish. Drawers have dovetailed joints and original embossed ring pulls. American made vintage furniture from about 1950, the maker's signature is lost. Size is 15 1/2" wide, 15" deep and 33 1/2" tall. Please view 16 photos at full screen size for best detail. Related items in photos are sold separately.